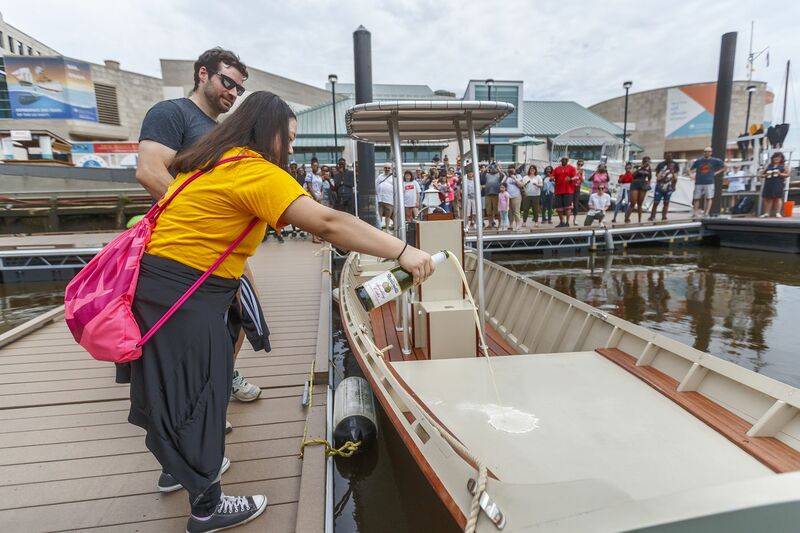 Vuochleng Kim, 15, from Bodine High School, pours sparkling apple cider to christen the JAWN, a boat that she and 70 other high school students built as part of a program at the Independence Seaport Museum that aims to expose underserved populations to science and technology. By the docks outside the Independence Seaport Museum, where just a week ago majestic tall ships were anchored, a freshly constructed boat awaited its christening Saturday morning. This one was a little less showy yet still worthy of celebration. The vessel was the finished product of the museum's 2018 youth boatbuilding program. Roughly 70 pupils took part and built the first motorboat in the program's seven-year history. Vuochleng Kim, 15, had the honor of leading the ceremony. "May you carry us safely a-sea," she began, clasping a bottle of sparkling cider that she'd soon pour. "I christen thee Jawn." The SAILOR (Science and Art Innovative Learning on the River) program runs each school year. It is designed as a STEM program, so as pupils learn ship construction, they sharpen their science, technology, engineering, and math skills. For the last two semesters, the program, which aims to reach underserved young people, has drawn teens from Bodine High School, Charter High School for Architecture and Design (CHAD), Mastery Charter School's Shoemaker campus, and Philadelphia Electrical & Technology Charter High School, as well as homeschoolers. As the high school students, right, who help build the JAWN, a Garvery boat, instructor Dave Dormond, left, from the Independent Seaport Museum, has to fill the tanks up with gas before he can take them out for a spin on the Delaware River on Saturday June 2, 2018. Kim attends Bodine and helped shape the knee of the boat, but also did her fair share of sanding. She thinks her career one day will be in a STEM-related field, but isn't quite sure which one. "I never thought about wanting to build a boat before," she said, "so it's very incredible." The Jawn — a slang word particular to Philadelphia that functions as a pronoun for pretty much anything — is a garvey, a type of work boat. Museum CEO John Brady said garveys have a long history of use in our region. "We try to pick as much [as possible] in the local tradition, so they get that connection," he said. Sailing forward, the Jawn will serve as a safety boat for kayaks and a vessel for collecting water samples, as well as other tasks in the Delaware River. Olivia Thomas, museum director of education, noted that the goal of the program isn't really to produce boatbuilders but rather "to put some of these mathematical and STEM concepts in another context." Dave Dormond, one of the program's boat shop educators, called it an opportunity for kids to work with their hands but also with one another. Students at work in the Independence Seaport Museum's SAILOR program. Janiyah Jordan, 15, goes to school at Mastery's Shoemaker campus. She hopes to be an actress one day, and figured SAILOR would teach her the team-building skills she'd need on a film set. A big takeaway, she said, was to "not always do everything yourself." Mylz Ward, 18, and Jihad Young, 19, come from a contingent of CHAD students who worked on the boat's console. In the past, the program has primarily built rowboats, so this was a newer educational element. "They had to explain the dos and don'ts of consoles. And it had to be ergonomic," Ward said. "We didn't want it to be boxy or too plain. This is actually my design right here. … Some people say it looks like a washer-dryer." Mylz Ward, left, 18, and Jihad Young, right, 19, both from Charter High for Architecture and Design, talk to Independent Seaport Muesum instructor Dave Dormond, right, about their construction of the boat they all built together, with 70 other sudents, called JAWN, a Garvey boat that will be used as a service boat for the museum, on Saturday June 2, 2018. Peers made that critique because features appear stacked, Young said. The two teens pointed from the dock, noting the shelf space they accommodated for, and the opening for wires to hang down. Ward and Young, who both plan to become carpenters, remember the large blueprint that guided them on the workshop floor. Just looking at it initially, they both agreed, they couldn't fully imagine what the finished product would be like. As the boat took shape, that changed. "It started coming together," Young, a graduating senior, said. "As we progressed, it just got better and better," said Ward, also finishing up at CHAD. "We went from pen and paper … to a 3-D — to a real boat."